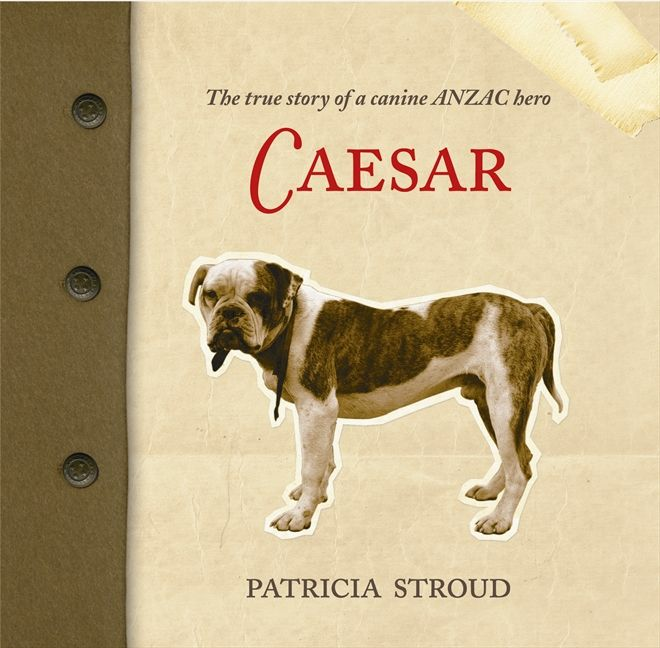 This book is based on the true story of Caesar, which was told to the author, Patricia Stroud, by her mother, Ida. Ida (aged four) was in the crowd when Caesar the bulldog, as official mascot, led the Rifle Brigade down Queen St in Auckland to board the ships that would take them to Egypt and the Western Front. As described in the book, Ida donated her blue ribbon for Caesar to wear. She gave it to her uncle Tom who was Caesar’s handler and he tied it onto Caesar’s collar. Caesar worked during the Battle of the Somme in 1916 as a Red Cross dog. These dogs helped the stretcher-bearers to rescue wounded soldiers at night from No man’s land, the area in-between the trenches of the two opposing sides. They were trained to look for something that belonged to the man, such as a coat or cap, bring that item back to the stretcher bearers and then lead them to the wounded soldier. Caesar was shot and killed in action. His handler, Tom, was temporarily blinded by mustard gas and sent to hospital in England. He married one of the nurses and they returned home on a hospital ship. The family history aspect of the story is underlined by the way it is told to three boys, James, Brendon and Michael, who are visiting their great-grandmother (Ida) in the summer holidays. She tells them about the parade, and how her other uncles also went off to war. 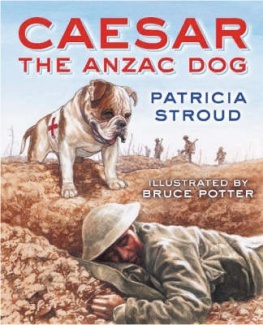 The book was reprinted in 2009, with extra content, as Caesar: The True Story of a Canine ANZAC Hero ("A recount of the life of the bulldog that became the official mascot of the 4th Battalion of the NZ Rifle Brigade"). 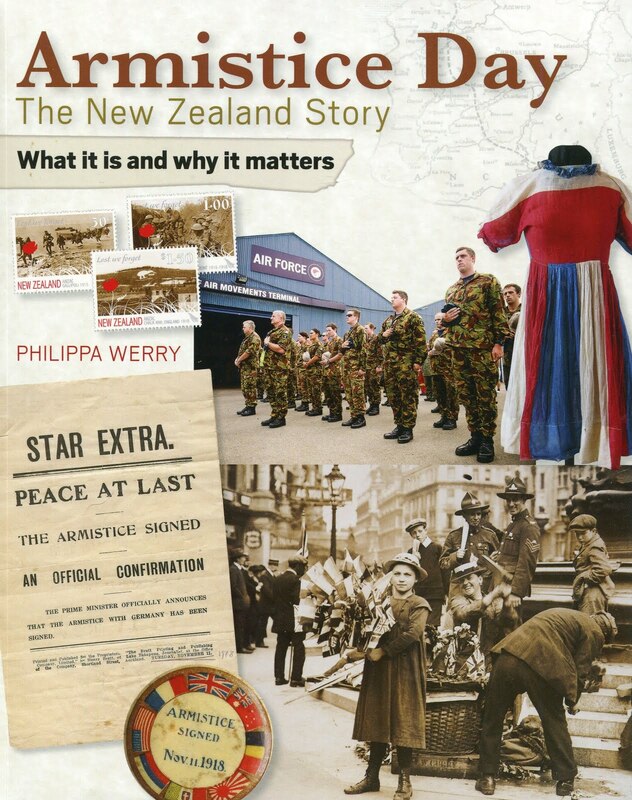 There is an interview with Patricia in the New Zealand herald, and here she is visiting the children of Botany Downs school. The Anzac puppy by Peter Millett and Trish Bowles is an appealing picture book based on the true story of a World War One mascot. The red poppy by David Hill, illustrated by Fifi Colston, tells the story of Nipper the messenger dog. This unusual vintage clip shows a French Bulldog working on the Western Front in France in 1917. The article about Caesar on the NZ History website includes this photograph of his collar (with an incorrect spelling of his name), now held at the Auckland War Memorial Museum (where you can also buy a soft toy Caesar!). I like this post about The Caesar story because you describe The book really well!I also had a look at some of your books. Have you written any non Anzac related books? If you have I would really like to read them! In your next blog post maybe you could make your writing a little bit bigger so that people can read it a bit better. I have read the Caesar book and I really liked it! I like the way Patricia describes the story really well. I think the best bit in the story is when Caesar is wearing the blue ribbon and he is on the ship, about to leave. Obviously the saddest moment is when they find Caesar dead! Hi Philippa, my name is Ben and I am in Room 9 from Waikowhai Primary School. I really liked the book Caesar the Anzac Dog. This blog post is perfect for our learning since we are looking at this book a lot. I have read the book with my class and it is amazing and also I love the fact that it is a true story. The storyline is wonderful and extraordinary. It was also really sad because Caesar died, but I did get happy for Tom when he married Kath Butcher. Thanks for posting a comment, Ben! I think you're right, this story is extra special because it is based on a true story. I like the way you describe it: wonderful and extraordinary! Hi Nicholas and thanks for your message! I'm glad you liked the information in the synopsis and the different links. Good luck with your blog! Hi Bruno and thanks for your comment! You blog looks great and I like your post about Caesar the Anzac dog. You must have learnt a lot from reading the book. I hope you get to see Caesar's collar in the museum soon! Blogpost response:Hi there Philippa. I am Joshua from Room 9 at Waikowhai Primary School. 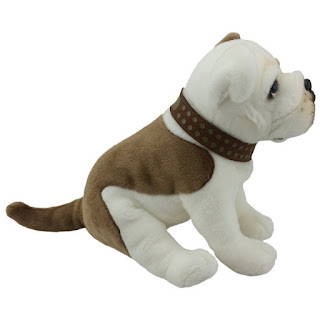 My class and I have aslo red Caesar the Anzac Dog it is a really good book don’t you think. But their are some sad bets like how ceaer had to go to war and when he got shot. I liked how caesar found some many wounded soilders. Let me know what you think by replying on my blog here is the link. Hi Joshua, thanks for sending me a message! I'm glad you liked reading Caesar the Anzac dog. You are right, there are some sad bits, but good books often do have sad bits in them too. I had a quick look at your blog and I liked the background! Hi Reegan, how did your comment end up as a reply to Joshua's comment?? I don't know how that happened!! Anyway thanks for your message and the link to your blog. I'm glad you liked the book about Caesar. You're right that it is a very good book, but sad too. Hi I am Sam from Room 9 at Waikowhai Primary School. We have read Caesar The Anzac Dog. We loved it! Awesome work I am hoping to read the book Best Mates and I would also like to read Riding into war. And please visit my blog at http://wpssamuelh.blogspot.co.nz/ thanks! Hi Sam, thanks for your blog comment. Great to hear that you loved reading Caesar the Anzac dog. I think you would enjoy Best mates too, even though it also has some sad bits in it. Good luck with your blog! Hi Philippa Werry, my name is Kayci and I am from Waikowhai Primary School. I really love your blog post about Caesar the Anzac dog. I like how you have other Anzac stories that relate to Caesar the Anzac dog. I think it is a really special book to me because of how Caesar went to war and died with the soldiers, for their own country and also for their own lives. I have read this book with my teacher and class. It is a very sad story because Caesar died in action. Other people in my class also think it’s a sad story too. I liked how they worked together to, fight for their freedom and country. I thought that the book was really interesting because I thought it was just a made up story but it was a true story. I didn’t know that Ida (That was the 4 year old girl) was telling the story about Caesar, I thought she was just reading the book to the boys. Hi Kayci, thanks for your message. Caesar the Anzac dog is a very good book and it is clever how it is told as a story to the boys. It is even more special to know that is is true. You have thought about it a lot and I like what you wrote about it in your message. Hi my names Lavinia from Waikowhai Primary School. Philippa your post was awesome. Caesar’s collar is cool. I felt that Caesar is really special to the soldiers who died in World War 1 and 2. When you wrote about Caesar on your blog how did you feel? I have read the book and it was wonderful. Patricia Stroud’s book had a lot of detail in it, that book was really interesting. I felt sad but happy that Caesar died, because at least he didn’t die in vain. Hi Lavinia and thanks for posting a comment! I think the collar is very cool too. I felt sad when I was writing about Caesar on my blog because writing about war is often sad, but I also thought (like you) that the soldiers must have been very glad to have a dog like Caesar or the other Red Cross dogs nearby. Hi Philippa Werry my name is Caitlin from Waikowhai Primary School. Your article about Caesar the Anzac Dog was really good. It was a really book, it was great to hear the exciting story. I really hope to hear another one of her stories from way back in the olden days or another great Anzac story from way back. I want to go and check at the museum to see if I can find the collar. I did read this book it was a great book I loved how they worked hard to fight for their freedom. I felt sorry and sad at the same time for them because of how Tom went blind and how Caesar got shot by a sniper even though Caesar was just trying to help a wounded soldier. Also how there were a lot of wounded soldiers lying on the ground. The way the story was being told to the three boys was cool, I actually forgot that Ida was telling the story to them, I thought she was reliving her life. Hi Caitlin and thanks for your message. I'm glad you enjoyed reading Caesar the Anzac dog. You sound like you really enjoyed it and thought about it a lot. I hope you get to see the collar at the museum and that you find some other good Anzac stories to read. Hi Shabeera and thanks for your message. I'm glad you liked this book and the illustrations. Well done on your blog, especially your trench diary and writing about what you did on Anzac Day. Hi Philippa I am Alex from Waikowhai Primary School. I liked your response on Caesar the ANZAC dog. Have you done any other responses on other World War One books? Hi Alex and thanks for you comment! You can find lots of other responses on other World War One books on my blog. 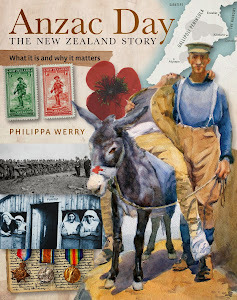 Another one you might like is called The Anzac puppy: http://childrenswarbooks.blogspot.co.nz/2014/03/the-anzac-puppy-by-peter-millett-and.html. I had a quick look at your blog too! Hi Philippa I am Abby from Room 9 at Waikowhai Primary School and I really like your blog. Personally I think your little article on Caesar the Anzac Dog was very informative. All the books that you write about the war and Anzac Day are very cool too. Yes Philippa I have read the book and I thought that it was sad because Caesar died. But it helped me think that not everything has a happy ending. Hi Abby and thanks for your reply! I'm glad you liked my blog and found it informative. You[re right that not every thing has a happy ending, and books about war can often be very sad. I really liked your blog post. I can’t wait till I get a chance to read the other books that you suggested. I learned that Patricia Stroud was told the story by her mother. Feel free to check out my learning blog! Yes I have read this book. I like how Ida had a very strong liking for the dog. I hope I see more books written about Caesar! Hi Dora and thanks for posting your message on my blog. I hope you get to read some more good books like this one. I had a look at your blog and it sounded like you had a great time on Anzac Day. Hi this is Joyce from Waikowhai Primary School. I really enjoyed reading about your blog post. I am looking forward to researching more about Caesar on newspapers etc. I learnt that Patricia Stroud was told the story by her mother Ida who is in the story. I have read the book and I thought it was very interesting and Patriaia told me a whole new story that I never knew of about Anzac Day. Hi Joyce and thanks for your message. I'm glad you enjoyed reading my blog post. The book about Caesar is such an interesting story. Good luck with your blog; I enjoyed reading your trench diary. Hi Philippa. I really liked this post because you described Caeser and what him and the soldiers did. I read the book it was a really good book. I was sad that he died. I also liked how you explained what happened in the book. Like the grandmother telling the story to her grandsons. If you would like to visit my blog just type in this address. wpsconroyc.blogspot.co.nz. Hi Conroy and thanks for your message. I'm glad you liked reading this book, even though it was sad in parts. Good luck with your blog; you have got lost of stuff up on there already! Hi Hame and thanks for posting your comment on my blog. I'm glad you liked reading about Caesar the Anzac dog. I had a look at your blog too and you've got lots of good stuff on there already. I liked your story about scoring the impossible try. Hi Philippa my name is Antonio from Waikowhai Primary School. When I was reading your blog post about Caesar the war dog I learnt that the author was a grandmother and a mom, and it’s amazing that you know all this information about Caesar. Why do you blog about the war? Have you read this book? Let me know what you think! Yes, I’ve seen the book and I think the book is great but there are some words that I don’t know how to pronounce or I don’t know what it means, but it’s a cool book. And I think your blog post of Caesar is awesome. Hi Antonio and thanks for your really nice comment! I'm glad you liked the book about Caesar (even with some hard words in it) and my blog post as well. Yes, I have read the book, and I blog about war books because I think they are really interesting, even if they are also sometimes sad or scary. Kia ora Kieren, thanks for your message and for telling me the bits you liked best in the book. Thanks also for the link to your blog. I love your Bio poem, it's great. Yes, the story about Caesar is pretty emotional at times. I hope you all looked after your teacher when he was going to cry!! Hi my name Sifa. From Waikowhai Primary School. I learnt that the author was a Mother and a Grandmother. I didn't know that Tom was marRied to a nurse when he got blind from the venomous gas. It’s cool that you know lots of stuff about the war. Hi my name Sifa. From Waikowhai Primary School. I learnt that the author was a Mother and a Grandmother. I didn't know that Tom was marRied to a nurse when he got blind from the venomous gas. It’s cool that you know lots of stuff about the war. Hi Sifa and thanks for sending me a message. I'm glad you got to learn some new stuff from reading the book about Caesar. The book has interesting characters in it too, like Tom. Hope you find some more good books to read. HI William and thanks for sending me a message about my blog post. I'm glad you liked reading it, and you liked the book too. You're right that the book helps you to understand a bit of what it was like in the war. Thanks for your blog; I had a quick look at your google drawing! 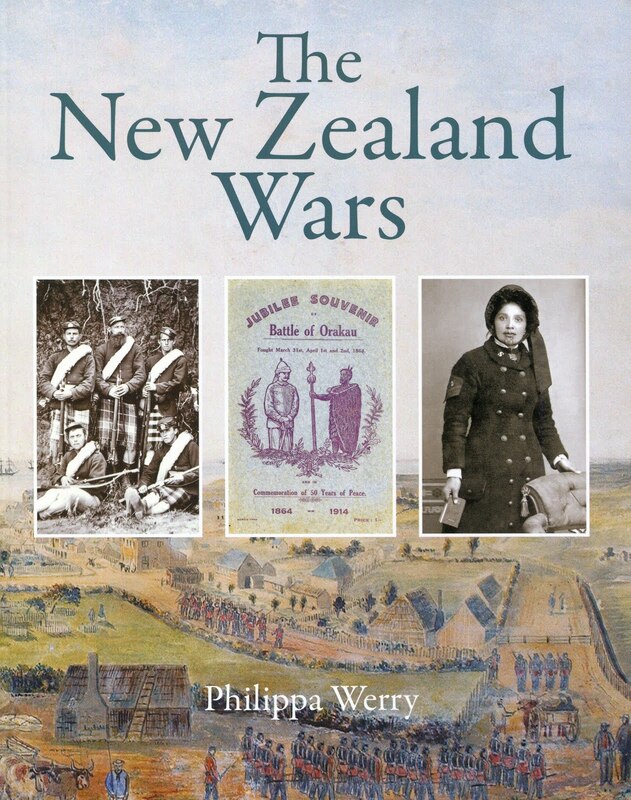 Hello Philippa Werry my name is Saskia from Room Nine in Waikowhai Primary school and I have read the book you gave information about that is called Caesar the ANZAC dog and I am happy to say that I loved reading it and did read it several times over. I also think that you wrote a very accurate synopsis and completely agree with it. Hi Saskia, thanks for your message and your nice comments on my blog post! I'm glad you thought it was an accurate synopsis. That's great to hear that you read the book about Caesar more than once. Often you pick up new things when you read a book a second or third time. You sound like a good reader. Hi Faidhi, thanks for your message. I enjoyed hearing about what you've been learning at school. Thank you for the link to your blog too. I had a look and I really liked the Thing Link. I've never seen anything like that before! I especially liked you line about the orange flamey horizon. Hi Philippa, I’m Hilary and I think that some of your information is really cool! Our teacher read to us the story and I thought it was really interesting but when Caesar died it was really sad, and I didn’t know that Patricia’s mom was actually Ida and that Ida is a real person! I didn’t know that the parts where the two boys, their dog and their mom were real parts of the story either! Please check out my blog, it's wpshilaryg.blogspot.co.nz. I hope you will make some more posts. Kia ora Hilary and thanks for your message. I'm glad you liked finding out the information on my blog post. It is pretty cool that there are real people in the story too. Thanks for the link to your blog. I had a quick look and I really liked your Fatu Feu'u inspired art. Hi Philippa my names Jasmine I'm from Waikowhai Primary School. I liked your blog, it’s really cool. I liked your book review as well. I I liked the cover on your books. My favourite cover is the Best Mates. I like the picture of Caesar that you put on.Yes i have read the book it really sad that Caesar died. I know that there not a happy ending in every ending . Hi Jasmine and thanks for posting a comment! I'm glad you liked the book review and it's extra nice to hear that you like the book covers too. 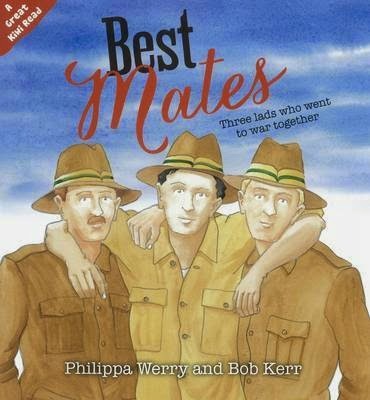 The cover of Best mates is one of my favourites. It's painted by an amazing artist called Bob Kerr. Yes, the book about Caesar is sad in parts, and it's true that not all books can have happy endings. Kia ora Faidhi, I think you sent me two messages, so I am extra lucky! And it's nice to hear that you have read Dawn parade as well. Kia ora Serene and thanks for your message. I'm glad you enjoyed this blog post and finding out lots of facts about Caesar. He was a pretty amazing dog. Thank you for the link to your blog. I had a quick look and I liked all your story starters,especially the one about the horrible disgusting pancakes! I hope your Mum doesn't make those for breakfast this weekend. Kia ora Claire and thanks for your message. I'm glad you liked my summary and that your class all liked the book. "Horrifically" is a great word. I am going to try and use it sometime. Thank you for the link to your blog. I had a quick look and I thought your story starter was pretty horrific too! I hope it has a good ending. Hi Nevaeh and thanks for your message. I'm glad you liked my blog post. You're right that the book about Caesar, Tom and Kathy is both a happy and a sad story. It's great to see all the work you are doing on your blog. Kia ora Karl and thanks for your message. I'm glad you enjoyed reading the book about Caesar. Ha ha you have read my blog carefully too because you're the only person so far who has mentioned the "internationally ranked powerlifter"! Good luck with your blog. (The address you gave me isn't quite right but I managed to find it anyway). Hi Skye and thanks for your message. I did write this blog post, but I didn't write the book about Caesar. But I did work hard to write some of my other books!! Here are three random things about me: I like swimming, my favourite colour is purple and I have been to Antarctica. I also liked the story about twisted ankles on your blog! Hi Philippa, my name is Sylvia from Waikowhai primary school. 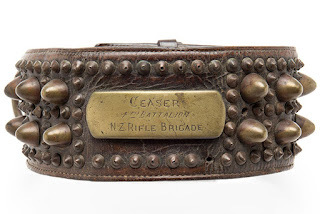 I really like the post about Caeser The Anzac Dog and all information you write about the story, I was so surprised how good you’ve described the book, I love all the pictures you posted and Caeser was so cute. I’ve read the book and it so sad at the end when Caeser died. What is your favourite part in the book? Hi Sylvia and thanks for your message. I'm glad you liked this post and all the pictures. I'ts hard to chose a favourite part of the book! Maybe when they get married? What is your favourite part? Hi Philippa , I’m Nethya from Waikowhai Primary School.. I really like the books you have written. I found it really sad. When they found that Caesar was shot dead.But it was very happy when Tom and Kath got married. The books you write are amazing. Could you come and check out my blog at http://wpsnethyaw.blogspot.co.nz/ Blog you later. HI Joshua and thanks for your message on my blog. I just had a quick look at your blog too and learned some cool facts about soccer! I'm glad you liked reading about Caesar. You're right, it would be great to have a dog as smart as him. Hi Bilal and thanks for posting a message on my blog. I had a quick look at your blog too and I liked your big welcome banner. I'm glad you liked the story about Caesar and how he helped the wounded soldiers. :Hi Philippa My name is Shiya and I go to Waikowhai primary school.I hope you go on room sevens blog tell me all about you. I hope you can make another book.It was really smart that you got the real picture of the dog.BLOG YOU LATER !!!! Kia ora Shiya, and thanks for your message. I'm glad you liked the picture of the dog on my blog post, and I hope you have fun blogging as well. 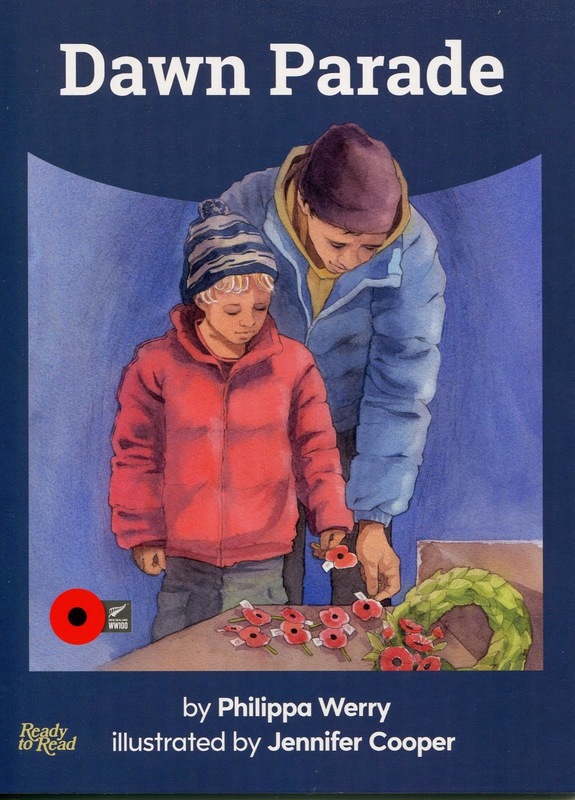 My name is Jerry R from Waikowhai Primary school.I have read parts of this book because we as a class read 'Caesar the Anzac dog' as part of shared reading. I really liked how you described Caesar.When I first read Caesar the Anzac Dog it reminded me of my cousins dog,but my Cousins dog is a girl German shepherd cross Labrador. I still wish I had a dog. The Children's Bookshop, Kilbirnie, Wellington.